How quick the end of the year approaches. 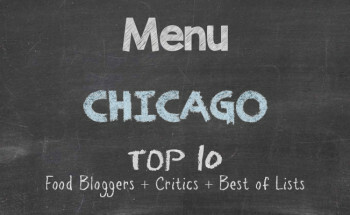 And now we are at the time when Chicago Alphabet Soup proudly presents the Top 10 Jaunts for 2015. There are numerous restaurants that I go to throughout the year. Many of them make it onto the blog. Some don’t. However, there are restaurants that stand out more. Those restaurants deserve highlighting. Several friends and others have asked what criteria I use for coming up with the top 10 restaurants for a given year. I never specified that when I compiled the lists in 2013 and 2014, so now is as good as time as ever to put forth the short list. The food is outstanding on a first visit, consistently outstanding on repeat visits. It doesn’t have to look fancy on a plate, but it must be divine on the palate. The service is top. Restaurants are service organizations and any time diners feel less than welcome, that alone can set a tone for a bad dining experience. And whenever a server makes recommendations that exceed your expectations, you will have struck gold. There is a constant desire to return after the initial visit to the restaurant. This comes not only from delicious food, but from a welcoming atmosphere and top service. For sticking with the theme of international cuisine, the restaurant must serve food that is from cultures abroad. Minus the continuous rattling off about Chicago being a racially divided city, many completely miss the fact that a city with as many various cultures cannot be that nightmarish. And authenticity in the food from the multitide of cultures and ethnicities should be celebrated and shown appreciation accordingly. I hanker for a cigarette when I leave the restaurant. I don’t smoke, by the way. In the same manner as previous years, the restaurants that made the list were restaurants where I went as a regular Joe. There were no advanced announcements and no one knew that I was blogging. Any restaurant that serves VIP treatment without the diners having celebrity status and food that you won’t shut up talking about is a restaurant that plies its trade well. So, ladies and gentlemen, I present to you in video forms the restaurants that exceeded my expectations for 2015. Until 2016, enjoy all and eat well. Awesome list and photos. Makes me want to go to all of them in one weekend. Love your comment on the cigarette. Unfortunately, I can’t come up with my list this year due to lack of visits. Hopefully next year. You covered several restaurants that I wish I had found when I was living in DC. Make your list now and let’s see how 2016 shakes out. I’m looking forward to reading more on WongEats.